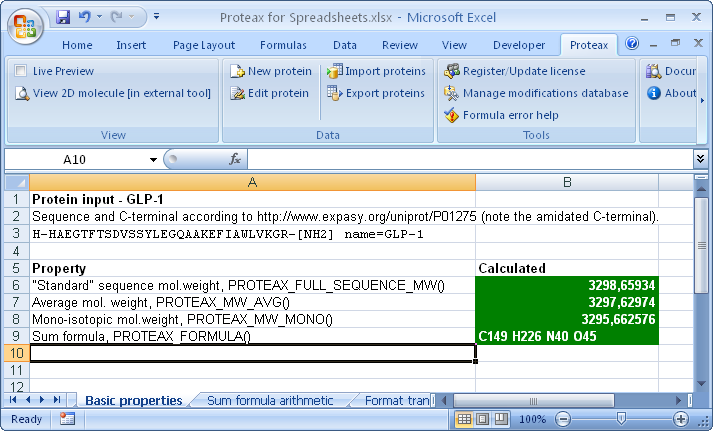 Proteax for Spreadsheets is a spreadsheet plugin that gives you protein chemistry functions within Microsoft Excel® or OpenOffice.org® Calc. You can analyze, change, and compare protein entries by using the spreadsheet functions that the Proteax add-in provides. 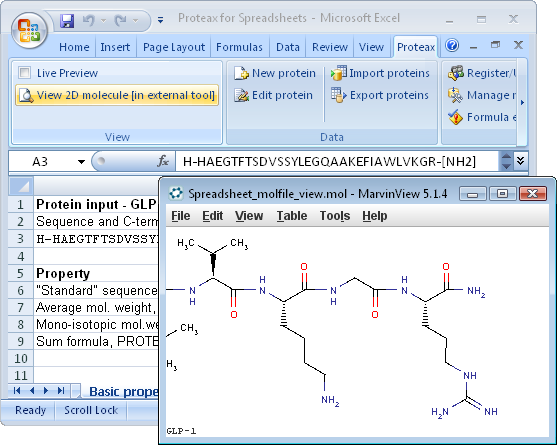 Proteax for Spreadsheets can visualize protein sequences and chemistry details in modified proteins using the built-in graphical live preview. Mass spectrometry work can be eased via the direct interface to Lighthouse Data's GPMAW application for protein editing and display. 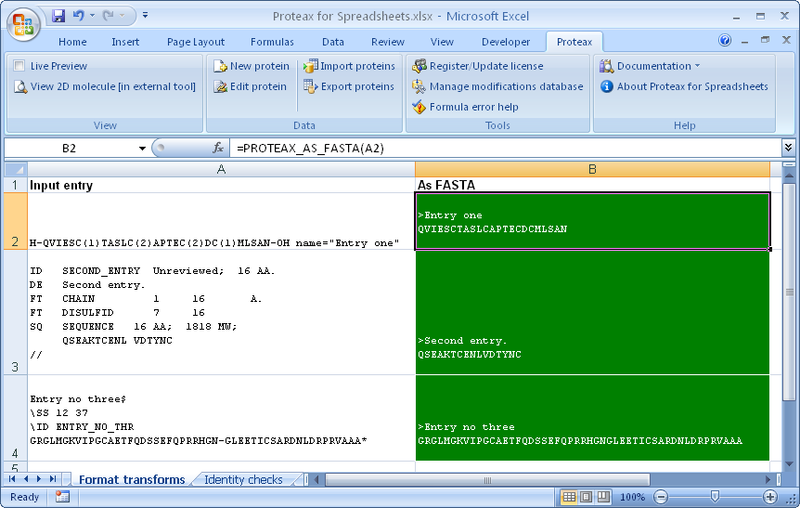 Proteax for Spreadsheets functions let you analyze the sequence and chemistry properties of protein entries. You can browse the available functions and interact directly with them by using the function wizards of Excel and Calc. Chemistry formulas in use in Excel 2007. Interactive testing of functions in OpenOffice.org Calc. Sequence and structural identity checks allow you to easily find duplicates. Proteax for Spreadsheets is able to normalize protein entries to ensure that the comparisons are not confused by the order of chains and internal rotation of cyclic chains. Normalization of sequences reveal identical entries that at first glance look different. Corresponding functions normalize the entry taking post-translational and chemical modifications into account. DerNot expressions describe the edit steps necessary for producing one protein entry from another; e.g. creating a protein derivative from a known reference protein. 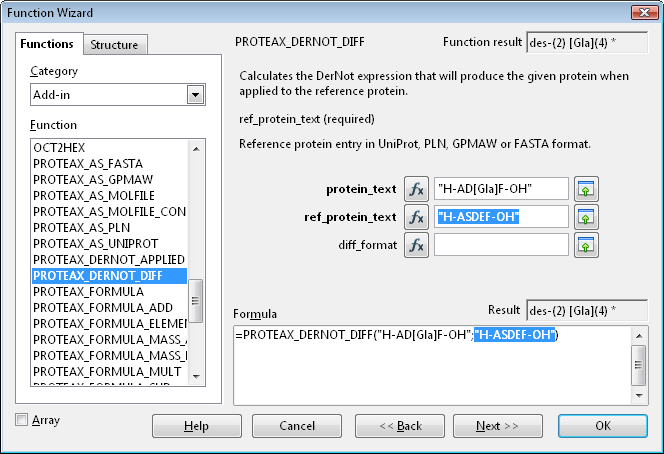 Proteax for Spreadsheets contain functions that can both calculate the DerNot expression needed for creating a protein derivative, and also apply a DerNot expression to a reference protein to create a derivative. DerNot expressions can be used as trivial names for protein derivatives. A variety of industry standard formats are used to represent protein entries. Proteax for Spreadsheets will automatically recognize entries in FASTA, UniProt, GPMAW, and PLN format whether you import them from file or type them in a spreadsheet cell. Proteax functions can be used to reformat entries inside your spreadsheet or you can export entries in the format of your choice. Protein entries may come in a variety of formats. The mixed entries in the A column have been reformatted in column B to FASTA format using the spreadsheet function PROTEAX_AS_FASTA(). 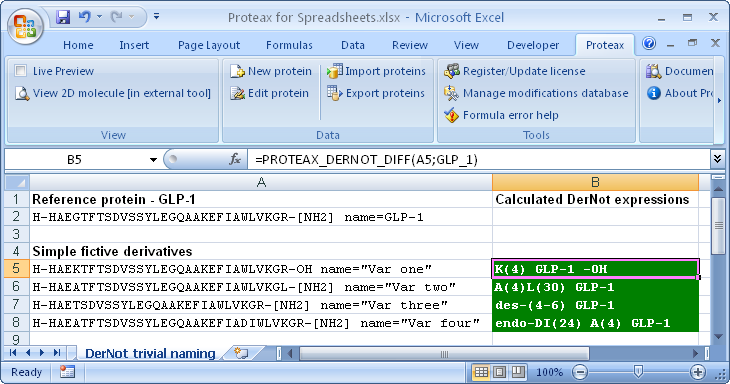 Proteax for Spreadsheets has a built-in Live Preview tool for visualization of protein entries. The Live Preview tool will track the currently selected spreadsheet cell so the visualization is always in sync with the spreadsheet. Integrated Live Preview lets you visualize the currently selected cell as both a protein sequence and its 2D chemical structure. Above, the amidation of GLP-1 is clearly visible when zooming in on the chemical details of the C-terminal (NB: Implicit hydrogens are not displayed in the preview but are accounted for in calculations). For publication-level chemical visualization Proteax for Spreadsheets lets you use external applications. Below ChemAxon's MarvinSketch has been used as chemical struture renderer. Protein entries can be viewed in full chemical detail in external applications. Users that have Lighthouse Data's GPMAW installed can edit protein entries in GPMAW. Changes are transferred directly back into your spreadsheet at the moment you press the "Save" button in GPMAW. Editing a protein entry starts the external GPMAW editor. Saving changes in GPMAW triggers a transfer of the changed entry directly back into the spreadsheet. Proteax for Spreadsheets includes functions that allow you to easily manipulate chemical sum formulas, e.g. add and subtract sum formulas and extract certain element abundances (number of nitrogens, number of oxygens...). 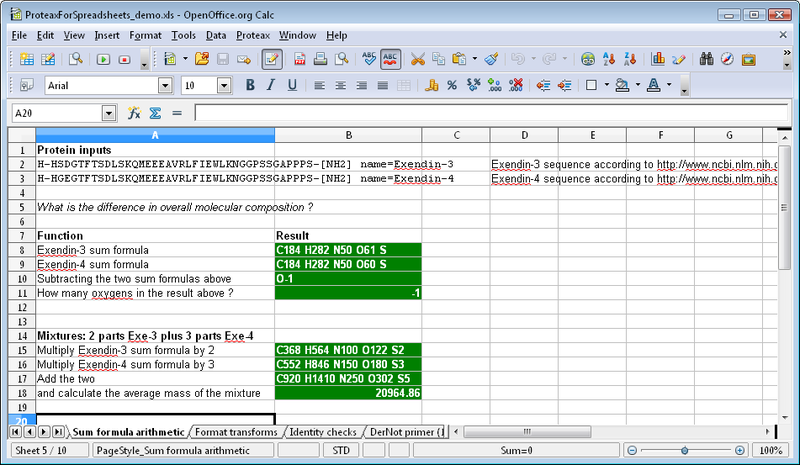 Below you can see an example of these functions used in OpenOffice.org Calc. You can install Proteax for Spreadsheets from a normal user account - you do not need administrator privileges. A fully functional demo version is available from the download area. (*) Also runs on 64-bit Windows 7.
for more information and to discuss future availability on Linux. 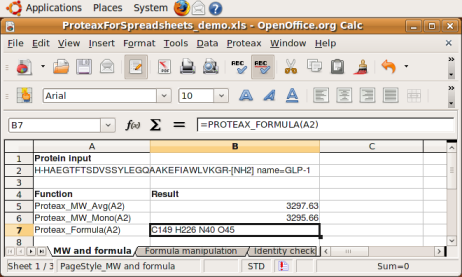 Development version of Proteax for Spreadsheets 1.1 running on Ubuntu 9.04.